Coal Tank LMS No 7720 on a two coach train. Where and when and what the train? I can’t pinpoint this actual footbridge but suppose it was fairly near the south end of Earlestown station. No 7720 was shedded at Plodder Lane from July 1947 until November 1948, when it was transferred to Edge Hill so (depending on the actual date) I guess the train would be heading for Bolton or Liverpool. If this is south of Earlestown presumably the location is nearer to Vulcan Halt/ Winwick Junction? Trouble is, although the flat land to the left of the train is flat and would accord with the Winwick area, I’m not aware of any particularly high ground as I think is shown to the right side of the photograph, behind the train. Pity the footbridge number plate is indecipherable. The most likely spot is just south of Winwick junction on the quadrupled main line but I also find the background a little puzzling. Could it be immediately before Ealestown station with the right hand lines going into the Curve station and the train about to take the Liverpool direction? This is the iron bridge I played on it as a kid. It went from Mill Lane over to the Sanky canal where the lock keepers cottage was. In the background is probably Dallam steel works. On the left was a waste tip and past that Longford. So the train really is “approaching Earlestown” – but from more than two & a half miles away. This bridge would be just over two miles north of Warrington Bank Quay station, between Dallam and Winwick Quay. Mention of Mill Lane reminds me that some 40 years ago there were traces of where a siding left the main line some half a mile on the Earlestown side of where our photo was taken. This siding crossed Mill Lane and entered the grounds of the Mental Hospital. I’m told it was to facilitate the carriage of dangerous patients who were carried in specially designed LNWR carriages. Can anyone confirm or add to this story? The location is actually Winwick Quay on the WCML. To the left of the photographer on the opposite side of the tracks the small Winwick Quay yard was situated, it fell into disuse in the 1960’s. The footbridge was replaced by a more substantial steel bridge on electrification in 1974. Today, industrial units (inc a steel firm) occupy the site of the old yard and it is almost impossible to see the railway as it is completely enclosed by trees on both sides. The junction which left the main line for Winwick Hospital was situated a little further north, roughly midway between Alder Lane and Alder Root Lane bridges and came off on the up side (a few hundred yards south of Winwick Junction). It was taken out of use around 1963-64 and I know that it was used for deliveries of coal for the hospital boilers and I have heard stories of ambulance trains during the war. Alder Lane is still a popular photographic spot – despite there being no Claughtons around now! Not Earlestown, the photo shows no platforms, and the left side steps seem to be the end of the bridge, instead of it being a middle set of steps, there are at least 3 tracks in the photo, there are only 2 at Earlestown, plus you would of course be looking towards Liverpool, and there would be a road bridge clearly in view. Also, there would be buildings in the background visible between the left steps and the loco. I would agree with Ian, about the location. Just adding that it is approx 600 yards south of the M62. There was a line running from the mainline into Winwick Lunatic Asylum, and from maps I have the lines went right inside the buildings ! This would be around 800 yards north of M62, where the Watery Lane Bridge crosses the railway, and indeed is still a popular place for photographers, especially when a ‘special’ is run. This is only my guesswork, not conclusive, just further info on the mystery photo. Here is a picture of Winwick Quay showing the footbridge. It is dated 1964. The view is looking south, the sidings are to the left, behind the signal box. To me it looks identical to the footbridge at Winwick Junction, ie, stone pillars and the footbridge steps go straight across, not at an angle like in Mystery Photo 19. As the path meets the railway line, inline with the bridge, and would cross the track leading to the sidings it would make sense for the footbridge to go straight across, and not come down in the middle of the lines. Winwick Junction footbridge had been removed by 1961, only the brick pillars remaining. Now if the Winwick Quay was replaced in the seventies I would hazard a guess it hadn't been changed prior to that, given that one side of the footbridge in the 1964 photo shows a brick pillar, is it likely that the otherside is on metal supports ? I would go with the Winwick Junction and Winwick Quay bridges being of the same type and layout. So if that is correct, then the bridge in No 19 is not Winwick Quay. The only thing I can think of, is if when Winwick Junction footbridge was put up, and Winwick Quay was an earlier bridge, then they changed it at the same time. I consider this photograph to be the iron bridge between Golborne and Bamfurlong on the Warrington to Wigan Line. It looks as if you can see in the distance the chimney of Golborne colliery. I'm sure Bernard Ward is correct in his identification. In Cooper's LMS Days there are another eight photographs taken around or from this footbridge, almost a mile north of Golborne station. By comparing the far background in those which look south, it becomes clear that No 7720 is at the same place. So the caption in the book is incorrect: the train isn't approaching Earlestown, but north of Golborne heading for Wigan. This gets all our speculations about Winwick Quay and so on out of the way, at last! 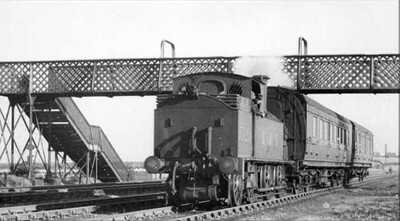 The date of the photograph of 7720 is given in the book as "about 1947" but it seems to have been taken earlier because four of the illustrations, dated August or summer 1946, show a colour-light signal gantry spanning all four tracks, about 200 yards south of the footbridge. On the mystery photograph and two others, there is no sign of this gantry, so they were presumably taken before it was erected. One of these is dated spring 1945, which is probably correct, but the other is said to be "late 1947" which is clearly wrong - it shows a streamlined engine which had been defrocked by then. I would guess that all three were taken on the same day, and that mystery photo 19 was taken in the spring of 1945. For those who have the book LMS Days, the photographs are on pages 10, 13, 22, 29, 33, 46, 49, 60 and 70.